The purpose of garage door maintenance is to improve the way the entire system works. For this reason, the service includes inspections, lubrication, quick fixes and adjustments. The door is tested and every part is checked since all components must work together to make the door move properly. Although there are differentiations among door types and materials, they all need routine services. When the system is maintained regularly, problems are prevented, accidents are avoided, components last longer and the door performs better and noiselessly. After years of servicing residential doors and offering garage door repair services, the professionals of our company can maintain all door types and help you keep a functional door that won't give you any problems. Despite the differences between various garage doors, every system's working parts must be checked every so often so that natural wear and tear will be fixed and appropriate adjustments will be made. With daily use, fasteners might get loose, lubricants can dry out, the force and travel limit settings of the door might need adjustment, and garage door springs could lose some tension. When all these things are taken care of, the door moves safely and its lifespan is prolonged! One of the first things our technicians do is inspect every part of the system. From the trolley, iron angles, the opener chain and the springs to the tracks, cables, rollers, hinges and the edges of the door, the entire door and its parts are checked. Inspections are helpful because they allow us to examine the door and its performance from up close in order to come to the right conclusions as to what must be done apart from simply maintaining the system. This way, the client is informed of the overall condition of his door and can arrange further repairs or even replacements. 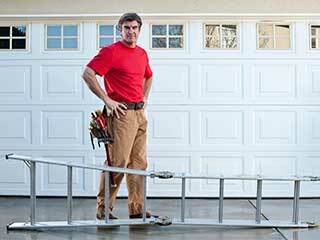 Garage door maintenance also includes testing the balance and force of the door and adjusting its travel limit. The opener sensors are checked so that they will be aligned, cleaned and properly wired to the motor. All parts in the opener control box are checked so that any problems related to the garage door clicker, antenna, gears or the motor will be prevented. Lubrication maintenance is equally essential. Parts are cleaned before they are lubricated so that the movement won't be stiff. This can occur when old lubricants are mixed with fresh ones and the dirt that has collected over time. Lubricants act as a protective layer for steel parts and enable them to move noiselessly without scratching, thus preventing the parts from damaging one another. With the door, opener and all parts checked, fixed, adjusted and lubricated, the system will work great. You can count on our experienced technicians and their devotion for providing excellent service. We offer residential maintenance service and are here to answer any question. Send us a message today!